L 150mm w 87mm h 93mm. Ytz10s-bs lithium ion, 12v - 8.6h. Warning: do not load when receiving the battery, it is already 80% pre-charged. Fits on the following vehicles: 612104. S 1000 rr sport, 2009 - 2011. S 1000 rr 2.0, 2012 - 2012. Cb 1000 r sc60, 2008 - 2010. Cb 1000 r, 2011 - 2012. Cb 1000 ra abs sc60, 2009 - 2010. Cb 1000 ra abs, 2011 - 2012. Cb 600 f hornet pc41, 2007 - 2010. Cb 600 f hornet, 2011 - 2012. Cb 600 fa hornet with abs - pc41, 2007 - 2010. Cb 600 fa hornet with abs, 2011 - 2012. Cb 900 f hornet sc48, 2002 - 2007. Cbf 1000 f sc58, 2006 - 2009. Cbf 1000 f sc58, 2010 - 2010. Cbf 1000 f, 2011 - 2012. Cbf 1000 fa / abs sc58, 2006 - 2009. Cbf 1000 fa / abs sc58 , 2010 - 2010. Cbf 1000 fa / abs, 2011 - 2012. Cbf 500 pc39c, 2004 - 2007. Cbf 500, 2008 - 2008. Cbf 500 abs pc39a, 2004 - 2007. Cbf 600 n / abs pc43, 2008 - 2012. Cbf 600 s / abs pc43, 2008 - 2012. Cbr 1000 rr fireblade sc57, 2004 - 2005. Cbr 1000 rr fireblade sc57, 2006 - 2007. Cbr 600 f, 2011 - 2012. Cbr 600 f1-f5 pc35a, 2001 - 2006. Cbr 600 fs sport pc35j, 2001 - 2002. Cbr 600 rr pc37, 2003 - 2004. Cbr 600 rr pc37, 2005 - 2006. Cbr 600 rr pc40, 2007 - 2008. Cbr 600 rr with abs - pc40, 2009 - 2012. Cbr 600 rr pc40, 2009 - 2012. Cbr 929 rr fireblade sc44, 2000 - 2001. Cbr 954 rr fireblade sc50, 2002 - 2003. Nt 650 v deauville rc47, 2002 - 2005. Vt 600 c shadow vlx pc21, 2004 - 2005. 690 enduro, 2008 - 2010. 690 enduro r, 2009 - 2011. 690 enduro r, 2012 - 2012. 690 smc, 2008 - 2011. 690 smr stickwheels, 2008 - 2010 Duke 690, 2008 - 2011. Duke 690 r, 2010 - 2011. Duke ii 640, 2003 - 2006. Lc4 640 sm super bike, 2003 - 2003. Lc4 640 sm super bike, 2004 - 2006. Lc4-e 640 enduro, 2003 - 2006. R 640 adventure, 2004 - 2006. Smc 625 super motorcycle, 2003 - 2005. Smc 690 r, 2012 - 2012. Supermoto 690, 2007 - 2009. Supermoto 690 prestige, 2007 - 2008. Sxc 625 lc4, 2003 - 2006. People 200i s, 2007 - 2008. Brutal 1090 r, 2012 - 2012. Brutal 1090 rr, 2010 - 2011. Brutal 1090 rr brembo, 2012 - 2012. Brutal 675, 2012 - 2012. Brutal 920, 2011 - 2012. Brutal 990 r, 2010 - 2012. F3 675, 2012 - 2012. F3 675 oro ohlins, 2012 - 2012. F4 1000 (all models), 2004 - 2006. F4 1000 r, 2006 - 2009. F4 1000 rr corsacorta ohlins, 2011 - 2012. F4 1000 r / s, 2010 - 2012. F4 1078 rr 312 / cc, 2007 - 2010. F4 750 (all models), 1999 - 2005. Year 400 burgman k7-k8-k9-l0, 2007 - 2010. Year 400 burgman l1 / 2, 2011 - 2012. Fz8 39p1, 2010 - 2012. Fz8 fazer 42p1 , 2010 - 2012. Fz8 sp-r ohlins, 2011 - 2012. Xp 500 t-max / abs 4b5, 2008 - 2011. Yfm 350 r raptor 5yt, 2004 - 2009. Yfm 350 r raptor, 2010 - 2011. Yzf 1000 r1 5vy, 2004 - 2005. Yzf 1000 r1 5vy, 2006 - 2006. Yzf 1000r1 4c8, 2007 - 2008. Yzf 1000 r1 14b, 2009 - 2010. Yzf 1000r1 sp - 14b, 2010 - 2010. Yzf 1000 r1 sp-r ohlins - 14b, 2010 - 2010. Yzf 1000 r1, 2011 - 2011. Yzf 1000 r1 tcs, 2012 - 2012. Yzf 600 r6 2co, 2006 - 2007. Yzf 600 r6 13s, 2008 - 2009. Yzf 600 r6 13s, 2010 - 2011. Yzf 600 r6 13s, 2012 - 2012. Equivalence: yt710s-bs width: 150 mm depth: 87 mm height: 93 mm voltage: 12v capacity: 8.6 pbeq cca: 210 std load: 4.5 max load: 35.0 weight: 0.90 kg terminal: + left. 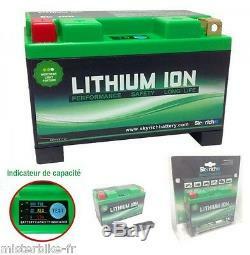 The latest generation of lithium motorcycle battery (li-ion). The skyrich brand introduces lithium batteries with increased weight and power. Technical advantage: 3 times lighter than a conventional lead battery. Quick charge in 6 minutes. Longer life, double compared to a normal battery. Perfect performance even at high temperatures. High protection because it is non-explosive and non-combustible. This battery does not require a special charger because a car or motorcycle battery charger is enough. This type of battery is used in competition for non-negligible weight gain. Features: only 1/3 of the weight of your original battery theoretical life 15 times longer than lead batteries no possible leak because no acid in the battery no lead, no cadmium, no mercury: less polluting product 4 times colder than lead batteries is practically unloadable technically, lithium technology surpasses lead / acid technology in every respect: safety, cleanliness, performance. The biggest change in battery since the advent of maintenance-free batteries - this battery is not based on lead or other heavy metals, it is lithium-based. It is identical in size to your original battery. Delivery time: 5 to 15 working days !! choose the delivery method before paying! Important: we offer for some small items, shipments bubble envelope stamped in letter. No guaranteed time or tracking. Thank you for taking note of it and not to hesitate, for 1 or 2 euros more, to choose a sending followed letter followed, relay point or. 03.25.55.74.71 / 06.62.69.50.19. Monday to Friday from 9h-12h to 14h-18h. The item "lithium battery ytz10s-bs motorcycle yamaha yfm 350 r raptor 2004 2011" is on sale since Monday, March 2, 2015. It is in the category "auto, motorcycle parts, accessories \ motorcycle \ spare parts \ others".